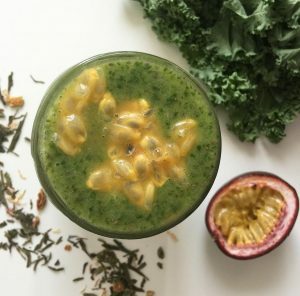 The talented recipe developer Sandra Lesniak and her blog, The Goodness Glow, created a stellar tea smoothie (smoo-tea) with a popular Dollar Tea Club tea that will no doubt spice up your summer, giving you an adventure for the tastebuds. It has the perfect combination of veggies, fruits, and one of our best-selling green teas. How can you say no to a smoo-tea? Blend well! This makes 2 mason jar smoo-teas. Drink this smoo-tea when you feel the need for an adventure. Whether you’re relaxing on a poolside or going on an exotic island tour, this fast and affordable DIY smoo-tea will make you feel #adventurevibes. Get Tarzan & Jane from Dollar Tea Club’s Tea Shop and check out The Goodness Glow’s other recipes on Instagram while you’re at it. This entry was posted in Recipes and tagged chiller, clean eating, dollar tea club, green tea, healthy eating, loose leaf tea, natural tea, plant based diet, Recipes, smoothie, summer, tea, tea smoothie, the goodness glow, tips, tropical, vegan, vegan recipes. Ever Wondered How to Make the Perfect Chai Tea Latte?